This time I’d like to tackle a bit more complex problem: SFINAE. I’m not using this paradigm on a daily basis, but I’ve stumbled across it several times and I thought it might be worth trying to understand this topic. Do you need this on a daily basis? Update: Look here for the follow up blog posts. Note: I'd like to thank kj for reviewing this article and providing me a valuable feedback from the early stage of the writing process. Also many thanks goes to GW who reviewed the beta version. First thing: if you have more time, please read An introduction to C++’s SFINAE concept: compile-time introspection of a class member by Jean Guegant. This is an awesome article that discusses SFINAE more deeply that I’ve ever found in other places. Highly recommended resource. Very briefly: the compiler can actually reject code that “would not compile” for a given type. 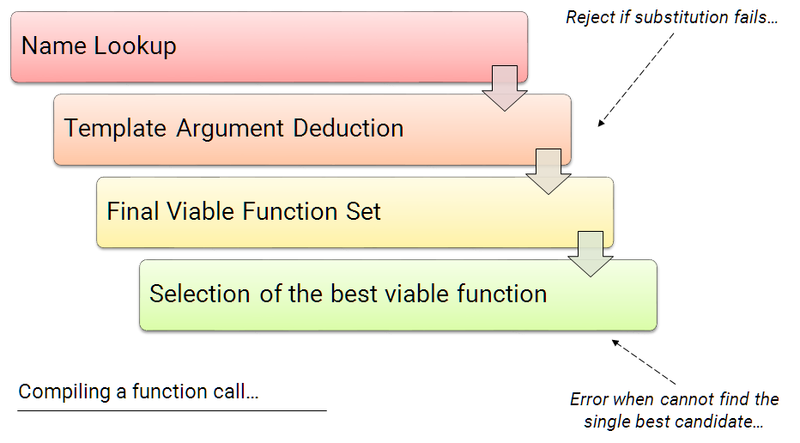 Substitution failure is not an error (SFINAE) refers to a situation in C++ where an invalid substitution of template parameters is not in itself an error. David Vandevoorde first introduced the acronym SFINAE to describe related programming techniques. We’re talking here about something related to templates, template substitution and compile time only… possibly quite a scary area! We have one awesome template function that returns T::internalType and we call it with Bar and int param types. The code can be built and run. Obviously, when we added an overloaded function for the int type, the compiler could find a proper match and invoke the code. But in the compilation process the compiler also ‘looks’ at the templated function header. This function is invalid for the int type, so why was there not even a warning reported (like we got when there was no second function provided)? In order to understand this, we need to look at the process of building the overload resolution set for a function call. For function templates the template argument values are deduced from the types of the actual arguments passed in to the function. All occurrences of the template parameter (in the return type and parameters types) are substituted with those deduced types. At the end we have a list of viable functions that can be used for the specific call. If this set is empty, then the compilation fails. If more than one function is chosen, we have an ambiguity. In general, the candidate function, whose parameters match the arguments most closely is the one that is called. In our example: typename T::internalType foo(const T& t) was not a good match for int and it was rejected from overload resolution set. But at the end, int foo(int i) was the only option in the set, so the compiler did not reported any problems. I hope you get a basic idea what SFINAE does, but where can we use this technique? A general answer: whenever we want to select a proper function/specialization for a specific type. Nice example here at SO of detecting count of object passed in initializer list to a constructor. Another example from foonathan blog - how to use SFINAE and Tag dispatching to construct range of objects in a raw memory space. One of the main uses of SFINAE can be found in enable_if expressions. enable_if is a set of tools that internally use SFINAE. They allow to include or exclude overloads from possible function templates or class template specialization. This function ‘works’ for all the T types, that are arithmetic (int, long, float…). If you pass other type (for instance MyClass), it will fail to instantiate. In other words, template instantiation for non-arithmetic types are rejected from overload resolution sets. This construction might be used as template parameter, function parameter or as function return type. enable_if<condition, T>::type will generate T, if the condition is true, or an invalid substitution if condition is false. enable_if can be used along with type traits to provide the best function version based on the trait criteria. As I see it, most of the time it’s better to use enable_if than your custom SFINAE versions of the code. enable_if is probably not that super nice looking expression, but this is all we have before concepts in C++17… or C++20. C++11 has even more complicated option for SFINAE. Basically, this document clears the specification and it lets you use expressions inside decltype and sizeof. In the above case, the expression of t1+t2 needs to be checked. It will work for two int’s (the return type of the + operator is still int), but not for int and std::vector. Expression checking adds more complexity into the compiler. In the section about overload resolution I mentioned only about doing a simple substitution for a template parameter. But now, the compiler needs to look at expressions and perform full semantic checking. BTW: VS2013 and VS2015 support this feature only partially (msdn blog post about updates in VS 2015 update 1), some expressions might work, some (probably more complicated) might not. Clang (since 2.9) and GCC (since 4.4) fully handle “Expression SFINAE”. Template errors: do you like reading template errors generated by compiler? especially when you use STL types? tag dispatching - This is a much more readable version of selecting which version of a function is called. First, we define a core function and then we call version A or B depending on some compile time condition. static_if - D language has this feature (see it here), but in C++ we might use a bit more complicated syntax to get similar outcome. The above template class will be used to test if some given type T has ToString() method or not. What we have here… and where is the SFINAE concept used? Can you see it? Obviously, there is no int::ToString method, so the first overloaded method will be excluded from the resolution set. But then, the second method will pass (NoType& test(...)), because it can be called on all the other types. So here we get SFINAE! one method was removed and only the second was valid for this type. returns NoType and since sizeof(NoType) is different than sizeof(YesType) the final value will be 0. What will happen if we provide and test the following class? Now, the template substitution will generate two candidates: both test methods are valid, but the first one is better and that will be ‘used‘. We’ll get the YesType and finally the HasToString<ClassWithToString>::value returns 1 as the result. How to use such checker class? Unfortunately, all the time we’re talking about compile time checks so we cannot write such if. However, we can use enable_if and create two functions: one that will accept classes with ToString and one that accepts all other cases. Again, there is SFINAE in the code above. enable_if will fail to instantiate when you pass a type that generates HasToString<T>::value = false. Open questions: how to restrict the return type of the ToString method? and the full signature actually… ? SFINAE works in compile time, when template substitution happens, and allows to control overload resolution set for a function. In this post, I showed a bit of theory behind SFINAE. With this technique (plus with enable_if), you can create specialized functions that will work on subset of types. SFINAE can control overloaded resolution set. Probably most of us do not need to use SFINAE on a daily basis. Still, it’s useful to know general rules behind it. Where do you use SFINAE and enable_if? If you have nice example of it, please let me know and share your experience! paragraph 8 in that section lists all possible reasons that type deduction might fail. C9 Lectures: Stephan T. Lavavej - Core C++ - part 1, s and 3 especially.